Loomis Bros. Equipment Co. sells and services both Milnor Single-Stage Membrane Press systems and Centrifugal Extractor systems. 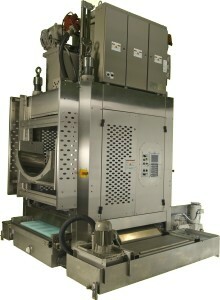 Multiple extractors can be used for even greater production by employing a wet laundry shuttle. Milnor Extraction Systems save time by removing more water through a large diameter cake that allows for fast drainage. The compact design is convenient and takes up less space compared to other extraction systems. The proven microprocessor control is easy to use and provides 16 programmable extraction sequences. Click here for more information on Milnor Extraction Systems.